Biotech | How much is a kidney worth in America today? ← Have you seen Sophia? A general understanding of chronic kidney disease (CKD) and its treatment is important for any who would pass judgment on whether kidney transplants are ethical, so let’s take a look. Diabetes and hypertension are the leading causes of kidney failure for adults. Kidney failure is called end-stage kidney disease (ESRD), leaving a person three options: 1. No treatment, but adjust diet or take medication to help symptoms; 2. Dialysis (two forms); and 3. a transplant. Undoubtedly, any of us who has a loved one with ESRD would want the best option for their overall health. It would be beyond sad to see them suffer without relief. We probably would initially embrace transplantation as wise and desirable. It is worth noting that CKD can be slowed or stopped with early diagnosis and treatment, and today there are over-the-counter tests for the condition. 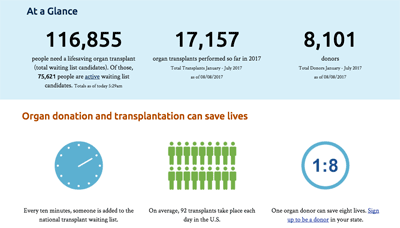 In the graphic, we see that about 117K people need a lifesaving organ transplant and only about 17K organ transplants have been performed so far as of mid-August, 2017. Statistics do not make clear from where or whom organs for transplant are received. But we can see that there is a wide gap between supply and demand. With such staggering costs, it is easy to see why a cost-benefit analysis of government compensation of kidney donors has been researched. A summary of the study follows. Chronic kidney disease is widespread, expensive, and projected to afflict nearly 17% of our population by 2030. Curing it is a medical priority. WaitListZero has lots of statistics that underscore the great need for donors, and its leaders have donated a kidney — They lead by example. All around, we see pressures building to solve this societal dilemma.